There's a story that Reyno Giallongo, chairman and CEO of First County Bank, likes to tell, earning appreciative smiles from his staff as he does so. Recently, one of the bank's investment advisers' car broke down on the way to a meeting in Darien with a potential client who was considering investing $2 million with the bank. When calls for roadside repair failed, employees from two First County Bank branches ensured the stalled car was towed and the investment adviser arrived at his meeting with about 30 seconds to spare, and landed the $2 million client. According to Giallongo, the story characterizes First County Bank and what distinguishes community financial institutions from the rest of the market: a local staff, a deep knowledge of the areas the bank serves and a strong customer service ethic. Dealing with the often personal matters of finance within a small circle of customers, a community bank hopes to engender the kind of trust that a long-standing family doctor does. "We're really a classic definition of a community bank," Giallongo said. "A real community bank has a commitment to employees, to the community and to its customers." Community banks, though smaller in size and scale, are the most populous financial institutions in the country. They make up 96.6 percent of all banks in the U.S., according to the Independent Community Bankers of America. More than 90 percent of U.S. banks have assets under $1 billion, placing First County Bank, which has assets of approximately $1.4 billion, among the larger community institutions. "I think community banks, which have grown out of the old savings bank tradition, have real value," said Joseph McGee, vice president of public policy and programs at the Business Council of Fairfield County. "You're seeing them grow. People like the sense that their bank knows them." As a mutual savings bank with no shareholders, First County has sought to identify itself as a thoroughly local bank, in a region of the state considered enormously attractive to financial institutions, large and small. Headquartered in Stamford since its inception in 1851, First County has 15 branches spanning from Westport to Greenwich, and a staff of 217, many of whom have worked for the bank for a quarter century or more. The daily transactions handled by a community bank like First County can span generations: parents handing money down to children, first-time homebuyers securing loans, the financing of family businesses. Giallongo calls real estate lending the "core competency" of First County Bank, and notes that by working within a small number of cities and towns, the bank's employees are familiar with the area housing prices and often with the history of individual customers' homes. "This is a business where you will do well in direct proportion to how well you know your client," said Sandra Greer, vice president trust and investment officer at First County, who recently joined the bank from BNY Mellon. "It's a very intimate business; how many people like to talk about their money?" Yet despite their ubiquity, community banks hold only 25 to 30 percent of the market share for all deposits, said John Carusone, president of the Bank Analysis Center in Hartford. "A handful of banks really control the vast market share of loans and deposits," Carusone said. "But community banks occupy an important role in the industry. They compete on a basis of personalized service, convenience and creativity catered to the customer's idiosyncrasies." At First County, its mutual bank charter, granted in 1861, ensures the bank is owned by and operated for its depositors. "The reason we like the mutual bank charter is because it enables us to take the long view of what we do in the community," Giallongo said. "We don't have to report our earnings to Wall Street." That division between locally based community banks and the behemoth financial institutions of Wall Street has blurred and sharpened in the wake of the recession. In 2008 and 2009, the reputation of all banks, large or small, "took a beating," Giallongo said. He was quick to point out many of the undesirable practices the larger banks were engaged in, like subprime lending, were rejected as "dangerous" by First County, which takes a more conservative approach to banking and lending. For a while, public opinion and regulatory scrutiny tended to lump the small and local banks in with the national institutions, Giallongo said. However, the public's disaffection with Wall Street quickly led to community banks being seen as an "isle of safety," Carusone said. "Community banks were perceived in quite a favorable light in the banking crisis," he said. More recently, local banks have improved their standing, and the view of the differences two distinct types of financial institutions appears to be growing clearer. 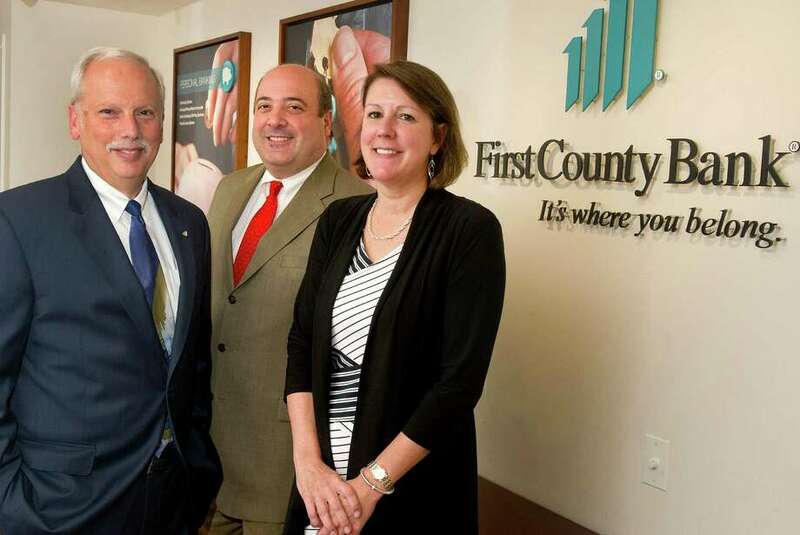 In the wake of the crisis, in 2009 and 2010, many customers switched from larger banks to the community bank approach, citing discouragement with the former's service, said Robert Granata, First County's newly promoted president and chief operating officer. "When the big banks were getting slammed for bad practices, we never did any of that," Giallongo said. "Community banking has benefited from taking the long view. The concept of community banks has resonated since 2009. "From an examination standpoint, regulators realize it wasn't mutual and community banks that caused it (the financial crisis). But we all pay the price for the banks that did it." In today's market, technology has become the "great equalizer" between large and small banks, Carusone said, allowing local community banks to offer most of the same products and services as the regional institutions, with the added benefit of more personalized service. One of the pervasive challenges of being locally rooted is following the crests and swells of the local economy. Without a wide geographic spread, a community bank's success depends more on the fortunes of the business around it, Carusone said. Community banks are also less able to diversify their sources of revenue, he said, and are more dependent on interest rates than larger banks. Distinguishing itself among other banks, both bigger competitors and other community banks, First County characterizes itself by its local service. Most of its employees live in or near the areas they serve, and customers have come to know many by name, Giallongo said. Celebrations of individual employees' 20-plus years at the bank are increasingly common. "We help (our customers) with very personal issues," he said. "Part of it is training, but part of it is finding the right people."